In this tutorial we are going to build a blockchain app. Blockchain technology is hot right now, and it has an immense amount of potential. But did you know that the future of the blockchain is building apps and services on top of the blockchain? I’ll show you how in this tutorial. You’ll learn how the blockchain works, what proof of work is for, and I’ll show you step-by-step how to build an app that interacts with the blockchain. The blockchain app we are going to build together is called Habitat, and you can use it to purchase fictive habitats on Mars. Always wanted to put your mark on the Schiaparelli crater? Now you can. And best of all: your purchase is immortalized in the blockchain! Yes, it’ll stay there forever. I’ll show you what that means in this tutorial. We’re not going to build the blockchain itself. There are plenty of smart people doing that! We’ll use a webservice to connect to a Blockchain-as-a-Service, called Tierion. Why? So we can build on top of the blockchain, because that’s where the real value of the blockchain technology lies. After completing this iOS tutorial, I want you to be able to build your own blockchain app – for whatever purpose – on top of blockchain technology. Let me know what you come up with! Let’s start by finding out what a blockchain really is. It’s awesome, important, and not that complicated. A blockchain is a so-called “ledger” of facts. And a ledger is like a database, with rows and columns. You’ve probably used ledgers all your life without knowing it. Your iPhone contacts list is a ledger, and so is your back-off-the-napkin list of vacation expenditures, and so is last week’s shopping list. The ledger is decentralized in a blockchain, which means that it does not have a central point of storage. Compare this with the opposite: a bank that has saved your money or valuables in one central vault. When the bank gets robbed, your money is gone. The blockchain is stored across multiple computers, via a peer-to-peer network, replicated on each one of them. Members of this network are called nodes. Every node has a copy of the blockchain. Blockchain nodes use cryptography to securely communicate with each other, and verify the identities of sender and receiver. The big problem that blockchain solves is so-called consensus. Let’s look at an example. I know about ledgers mostly from a video game called L.A. Noire, published by Rockstar Games. In the game, that’s set in Los Angeles in 1947, you’re a police detective and you have to solve murders. One way to gather evidence in your investigation is by checking out ledgers in shops, for instance for the sale of guns. In one murder case, you can find out that Bob bought a gun similar to the murder weapon in a gun shop close to the murder location. That’s a pretty helpful ledger! Which Ledger Entry Is Right? But how do you know that the ledger contains the right information? That’s a big question! You’d typically solve that by means of authority and trust. You trust that the shopkeeper puts the correct entries in his ledger. You can also verify entries in the ledger with other independent data sources. In most of these examples you rely on the trust, integrity and authority of an intermediary. When your trust in this intermediary fails, all hell breaks loose. When you can’t trust the independent intermediary anymore, who can you trust? The blockchain now has a problem. Because it’s decentralized, there is no central source you can trust. How can you trust any of its nodes? How do you add correct entries to the ledger? What’s keeping a node from sending false information for its own benefit? The blockchain uses a principle called proof-of-work. Before a fact is accepted as true, you need to prove that you did some work. The facts in our ledger are part of a block. The block contains a group of facts. Facts can contain any sort of data. All blocks are part of a chain. Every block points to the previous block in the chain. There is only one chain of blocks (“blockchain”) in the entire system, and every node has an identical copy. Facts that haven’t been added to a block yet are pending or “unconfirmed”. Special nodes in the network, called miners, create new blocks from pending facts. Miners compete over who gets to add the new block to the chain. Every miner tries to find the solution to a hard mathematical problem. This is done with a cryptographically secure hashing algorithm. The only way you can find the solution is by brute-forcing. Miners try random combinations until they find a result that is correct. When a miner has successfully found the solution, the facts in that block are considered confirmed. The miner gets a reward. The block is sent to other nodes for validation and becomes part of the blockchain. Every block contains a reference to the previous block. Because of the way hashing works, you can’t change a block once it has been confirmed. So you can’t easily go back in time and change a block earlier in the chain. The blocks of popular cryptocurrencies, like Bitcoin and Ethereum, contain monetary transactions. When a transaction is confirmed, you can ensure that the money can only get spent once. Miners get a reward when they successfully mine a block. Such a reward, like bitcoin tokens, is typically worth a lot of money. That’s why they keep mining! Thanks to the proof-of-work principle and cryptographically secure hashing algorithms, the blockchain is secure. You can only spend your bitcoin once. But how does that work for blockchains that aren’t used for monetary purposes? The explanations in this chapter are deliberately kept simple. I’m sure I made mistakes somewhere. You need a PhD in cryptocurrency if you want to understand 100% how this stuff works. Did you spot a mistake? Feel free help us understand blockchain technology better by leaving a comment below! The Bitcoin blockchain works because bitcoin are worth money. Miners mine bitcoin, and confirm monetary transactions, because they’re incentivized to do so. As a result, we can pay for things with bitcoin. If you want to build an app on top of blockchain technology, to provide proof of some facts, like housing prices, medical records or education certificates, then do you need miners? Think about it like this. Confirming monetary transactions is just a service that miners provide. Anything that provides a proof of facts is a service too. Just as a service-providing developer, writer, or designer charges money for their time and creativity, the facilitator of a blockchain can charge for the proof of facts that their blockchain provides. An organisation can pay miners with the money it makes from providing the blockchain service. It can do so with cryptocoins, or by using other means. Reading data from the blockchain is free, but writing to it costs money. It’s an intriguing system, isn’t it? Blockchain-as-a-service is capitalism at its finest. You need the proof, and we’ve got the miners who can provide it. Some permissioned blockchains don’t use proof of work, but instead rely on other ways to verify facts. These blockchains don’t need miners, and as a result, some consider them shared ledgers instead of blockchains. A great number of companies offer Blockchain-as-a-Service platforms, including the typical giants like Microsoft, IBM, Amazon, SAP and Oracle. Interesting projects include Hyperledger, from the Linux Foundation, and R3, that’s backed by a ton of big banks. In this tutorial we’re going to use the public Blockchain-as-a-Service, or blockchain proof engine, Tierion. Tierion has a simple and powerful API, and we are going to use it to store data in the blockchain, read from it, and verify that data. The Tierion platform has an added benefit: they’re using the Chainpoint open standard to link their own blockchain to the larger public Bitcoin and/or Ethereum blockchains. It’s like a chaining of blockchains by using a so-called Merkle tree, that ultimately leads to a chain of proof that’s linked to the larger blockchains. What that means in layman’s terms is that, when using a Blockchain-as-a-Service such as Tierion’s, you’re not just relying on the integrity of their organization and platform, but also using the decentralized power of the Bitcoin and Ethereum blockchains. It’s another level of chain-of-proofs and security. Important: In this iOS tutorial we’ll directly interact with the public Tierion API, for educational purposes. You’d never do that in a production app! I’ll explain more going forward, but if you are building a production-ready blockchain app, you’ll want to use a go-between webservice for authentication, logging and access control, depending on the requirements of your app. Now, back to the blockchain. Blockchain technology is as useful as the purpose for which you use it. Although it is compelling to become a facilitator of blockchain technology, I think the real innovations will be made by small companies that build on top of the blockchain. That’s you, by the way! Upload proof of your CV, badges, honours, former employers, pay-grades etc. When implemented correctly, blockchain technology allows you to verify the truth. Alright, enough about blockchain technology. Let’s use it to build a blockchain app! This tutorial wouldn’t be much fun if it didn’t show you how to create a blockchain app. So that’s what we’re going to do next! Think of it like a land registry or cadastre, that stores proof that Bob is the truthful owner of Bob’s Red Fantasy Land in the Schiaparelli crater on Mars. When a user taps one of the cells, they can choose to Purchase or Verify a habitat. Any habitat will show its most recent owner. You can also track the blockchain status of a purchase with the app. 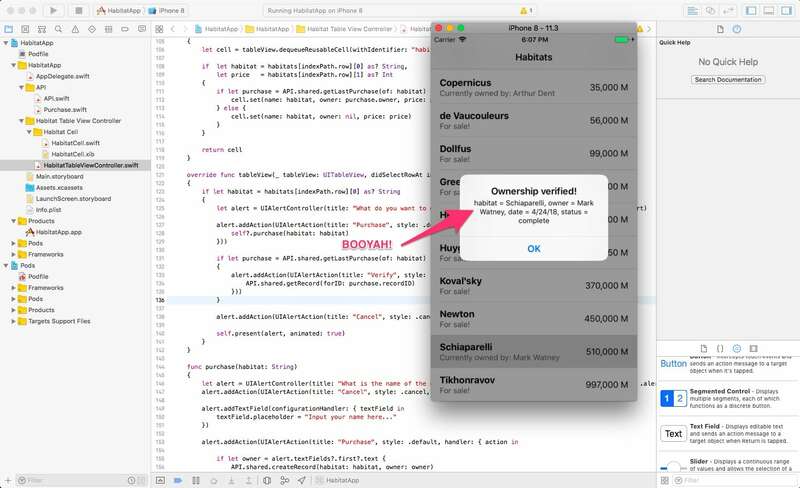 purchase.date       = "March 14, 2018"
Note: It’s only logical that we use Mars’ unofficial currency for habitat prices: the Marsoleon, with symbol M.
This tutorial assumes you have at least a basic understanding of Swift and Xcode, and that you’re familiar with CocoaPods, networking, JSON and REST APIs. If you feel out of your depth, I recommend you check out our Zero to App Store iOS development course. Then, scroll down, choose the Empty template from Other and click Next. 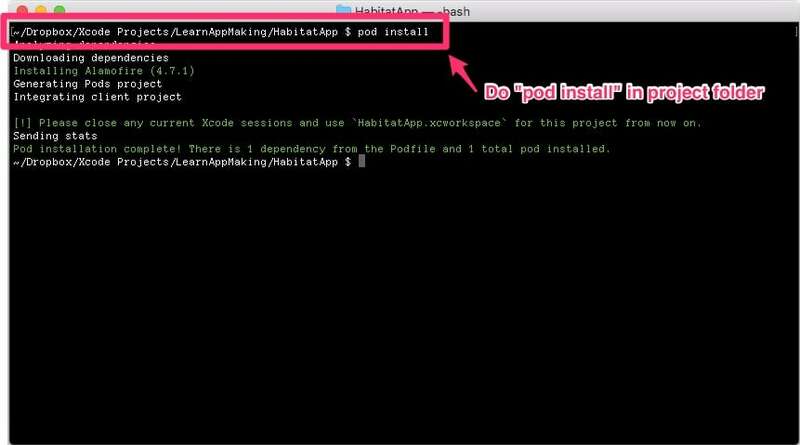 Then, name the file Podfile (no extension, just “Podfile” with an uppercase “P”) and make sure to save it alongside the HabitatApp.xcodeproj file. Then, add the following code to the podfile. This tells CocoaPods we want to use the Alamofire pod in our app project. Then, save the file, then close the Xcode project, and then close Xcode. Then, use Terminal to go to your project folder with cd and type this on the command-line: pod install. This installs Alamofire into the Xcode project. Finally, open the new HabitatApp.xcworkspace workspace file in Xcode. Our blockchain app will use the Tierion Blockchain-as-a-Service (BaaS) platform. You’ll need a free account to use their API. 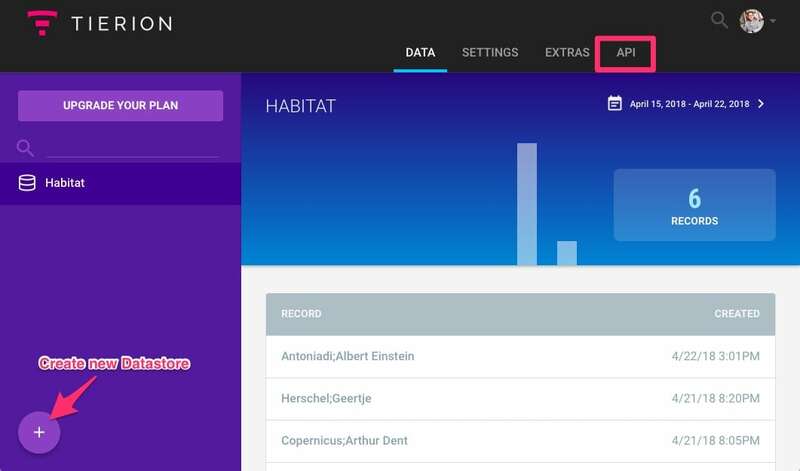 If you already have a Tierion account, or if you forgot to make a Datastore, you can create the `HabitatApp` datastore on your Dashboard with the `+`-button in the bottom-left of the Dashboard page. 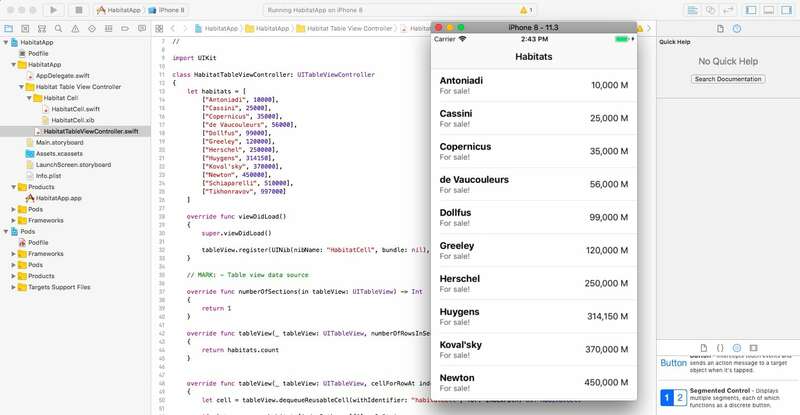 Our blockchain app will use a simple table view to display information about the habitats and their owners. The Single View App template contains a boilerplate view controller. We don’t need it, so let’s delete it. First, locate the ViewController.swift file in the Project Navigator and delete it, by right-clicking and choosing Delete, and then Move to Trash. Next, let’s create that table view controller we need. As you know, a table view controller is just a view controller with a table view as its view property, and a few extra delegates. The new table view controller class appears. Feel free to remove the code comments, so your code looks a little bit more like mine. Also, I usually put view controllers in their own folder in the Project Navigator. For the remainder of this tutorial, next time when you’ll need to create a new file, you now know what to do. Right? Awesome! We just removed the only view controller of our blockchain app from the app’s Storyboard. Let’s add another back in! That last step wraps the table view in a navigation controller. Even though we won’t use navigation in this blockchain app, it gives a nicer structure to the app’s user interface. You can also set the navigation title to “Habitats”, by setting the Title field of the Navigation Item of the table view controller (with the Attributes Inspector). When you run the app with Command-R or the Play button at this point, the navigation bar and table view controller should show up nicely! Our blockchain app will display information about habitats on Mars, including their owners and purchase prices. The table view isn’t of much use to us right now, because it can’t display that data. Let’s change that! We’re going to create a custom table view cell. That’s a UITableViewCell subclass with a custom XIB file, that contains layout information. Then, we’re going to create 3 properties, one for each of the UI elements this table view cell has. @IBOutlet attribute tells Interface Builder that these properties can be connected to a UI element, as an outlet. The weak attribute ensures that an instance of HabitatCell doesn’t retain references to these outlets when the cell gets deallocated, and helps us to avoid a strong-retain cycle. Lastly, the properties are optionals because outlets can be nil during their life-time. You already know that table view controllers efficiently reuse their cells, so they won’t have to be constantly created anew. Every table view cell has two functions, awakeFromNib() and prepareForReuse(), to help with cell reuse. So, long story short, we’re going to use a function called commonInit() to code that resetting once, and use it twice. Easy-peasy, right? This function resets each of the labels to contain an empty string. Finally, create a new function prepareForReuse(). This function needs to be overridden from the superclass with the override keyword. You’ll also need to call the superclass implementation for prepareForReuse(). And of course, you need to call commonInit(). And the first two functions both call commonInit() in their function bodies. Awesome! Do you notice how I’m first explaining the steps we are going to take, and only later on give you the right Swift code for that step? I do that deliberately! It’s easy to fast-forward through this tutorial by just copying-and-pasting the source code. You learn nothing that way! Instead, pace yourself, complete the steps as I describe them, and check your work with the Swift code samples. Later on in this tutorial, we’ll use the custom table view cell together in the table view controller. The table view controller will load the cell, and based on the habitat data, we fill that cell up with the right information. Technically, we could access the properties of the cell directly – but that stinks. When a habitat does not have an owner, the owner parameter will be nil. Use it to show a “For sale!” or “Currently owned by: [owner]” text depending on the ownership status. ownerLabel?.text    = owner == nil ? "For sale!" : "Currently owned by: \(owner!)" This will show that information in the table view cell. Neat! In the above code sample we’re using string interpolation with "Owned by \(owner)" to use a variable’s value in a string. We’re also using conditional binding with if let because string(for:) returns an optional value. So… we’ve written some Swift code, but we haven’t set up any user interface elements in Interface Builder. Oops! When all else fails, remove your constraints, try again, or leave all of them out altogether! Then, locate the Connections Inspector on the right. You should see nameLabel, ownerLabel and priceLabel in the list, with small dots on the right. Finally, for each of the labels, drag from the dot next to the outlet in the list to the right UI element on the canvas. Now that we have the blockchain app’s UI set up, let’s bring it to life! We’ll need to add some data to the table view. That habitats property is a constant, with the let keyword, so it can’t change once it has been set. We’re not specifying a type, so the Swift compiler will infer that for us, but we know that the type of habitats is [[Any]]. Surprised? We’ve created a nested array, so an array of arrays, with both String and Int objects in it. An array can only have one type, so it has to be Any to accomodate both String and Int objects. The data in the habitats array represent the names of craters on Mars, such as Schiaparelli, and the imaginary costs (in Marsoleons) of purchasing the habitats located there. Those three functions are delegate functions, and they are part of how a table view controller works. At certain times, our implementations of those functions are called. They are used to provide the table view controller with information, such as the number of cells the table view contains. We can use them to customize the table view and to respond to events. This is called delegation. 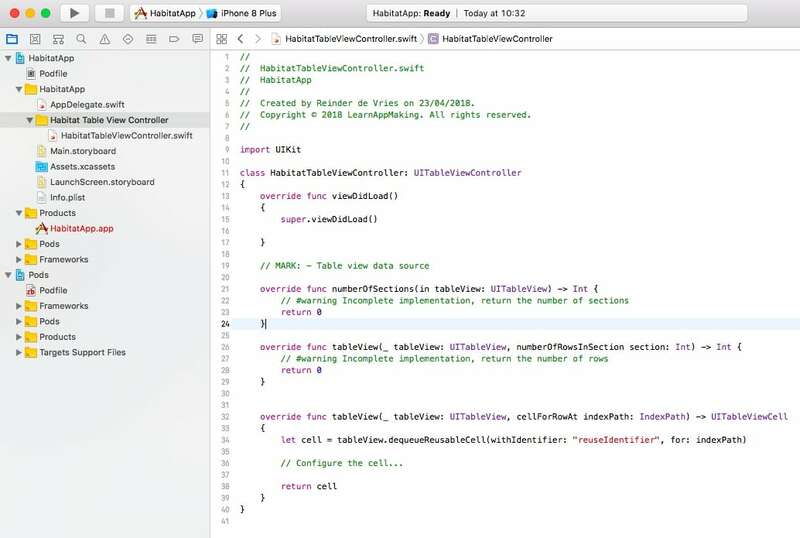 On top of that, UITableViewController has default implementations of these delegate functions that we override. First, we have to tell the table view we want to use a custom cell. We’ll do so by providing the XIB and a reuse identifier. Always wondered what the difference between a XIB and a NIB is? Both are Interface Builder files, i.e. they contain UI information, but a XIB uses an XML format (for Xcode) and a NIB uses a binary format (for the app binary). Therefore, Swift functions that use these UI files consistently use the word “nib”. Every collection in Swift, such as arrays and dictionaries, that conform to the Collection protocol, have a property count that’s equal to the number of items in that collection. Finally, we need to change one last function: tableView(_:cellForRowAt:). This function is used to provide table view cells to the table view. 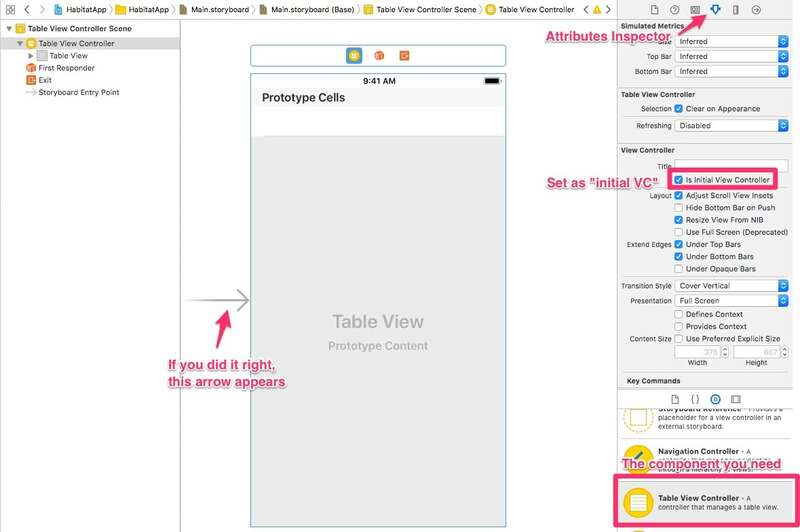 The input of tableView(_:cellForRowAt:) is, along with a table view instance, a value of type IndexPath, that contains the section and row index of the cell. The output of this function is of type UITableViewCell, so that’s the cell we need to create and provide back to the table view controller. The number of cells you need to provide are based on the return values of numberOfSections(in:) and tableView(_:numberOfRowsInSection:). The function tableView(_:cellForRowAt:) is called every time the table view controller needs a cell. The function gets the row and section indices for that cell via the indexPath parameter. You get where this is going. We can get the data for that cell by using the indexPath.row value as the index of your data source collection. Can you confirm for yourself that in our blockchain app, the indexPath.section is always 0, and that the indexPath.row runs from 0 to 11 (12 in total)? Great! Fun fact: The table view controller doesn’t request all needed cells at once. It will call tableView(_:cellForRowAt:) selectively, so only for cells that are inside the viewport. Dequeue a reusable table view cell with identifier "habitatCell"
Force-downcast with as! that cell to HabitatCell, or use conditional binding with as? First, we’re dequeueing a cell using the "habitatCell" identifier and the indexPath. This is how the dequeue mechanism of a table view controller works. It has a cache of cell objects that can be reused, because that’s quicker than creating new objects every time a cell is needed. Then, the return type of that function is UITableViewCell. We need it to be of type HabitatCell, so we can use our set(...) function, so we force-downcast the cell to HabitatCell. The cell object doesn’t change, but we treat as if it has the HabitatCell type. First, we can get to the right item in the habitats array by using indexPath.row. Finally, we’re using optional casting to go back from Any to String and Int. We’re combining this with optional binding, so the values get neatly assigned to non-optional constants habitat and price. Then, using habitat and price as arguments, we call cell.set(...). This is the function we created earlier, that puts the values as text in the right UI elements. Note how we’re using nil for owner, because these habitats have no owner yet. Finally, we’re returning cell. Because the type of cell is a subclass of UITableViewCell we don’t have to cast it back. Awesome! At this point you should be able to run your blockchain app with Command-R or the Play button, and see every habitat show up in the table view. Especially verification is important, because you want to know if a record has successfully become part of the blockchain. The purchase data, as introduced earlier in this tutorial, needs some organizing. We could pass it around as a dictionary in our code, but that’s prone to errors, so let’s create a class. With an array of Purchase objects we can find out who owns which habitat. We’ll also store this data in the blockchain, and populate our Purchase objects with data from the blockchain. First, create a new file in Xcode. Use the Swift File template and name it Purchase.swift. See how they’re initialized with empty strings? The Date() object represents the current date and time. return "recordID = \(recordID), habitat = \(habitat), owner = \(owner), date = \(date)"
This is a computed property. Instead of containing a fixed value, it executes a small function when accessed, which returns a dynamic value based on the properties of the Purchase object. This description property is called whenever the object is treated as a string, for instance by print(), so we can effectively use it to print out a description of Purchase instances. We’ll use this Purchase class throughout the app. Let’s continue! This description property is described in the CustomStringConvertible protocol. You don’t have to implement it. If you don’t, an object of type Purchase will just show up as “Purchase”. When you do implement it, however, the object will be printed out with a nicely formatted string. Next up is the API class. It is responsible for interacting directly with the API. We’re creating a separate class for this purpose, so it doesn’t get all tangled up in the rest of our code. We’re using the Singleton pattern to give access to one shared API instance everywhere in our code. First, create the a new Swift file and name it API.swift. This allows us to use code from the Alamofire library in this file. If you haven’t yet integrated Alamofire in your project, go back to the relevant previous step. Interestingly, we’re referencing an instance of the class API on the class API. That’s why it’s often referred to as a shared instance. Don’t misuse the shared instance or Singleton pattern! It’s easy to create a God class with all sorts of code and give access to it anywhere in your code, but that’s not the purpose of a singleton. You should only use the Singleton pattern for objects that you need only one instance of, that has one single purpose, that contains code that should be accessible anywhere in your app, and only when that code doesn’t belong anywhere else. So, we need a way to get all records from the blockchain. 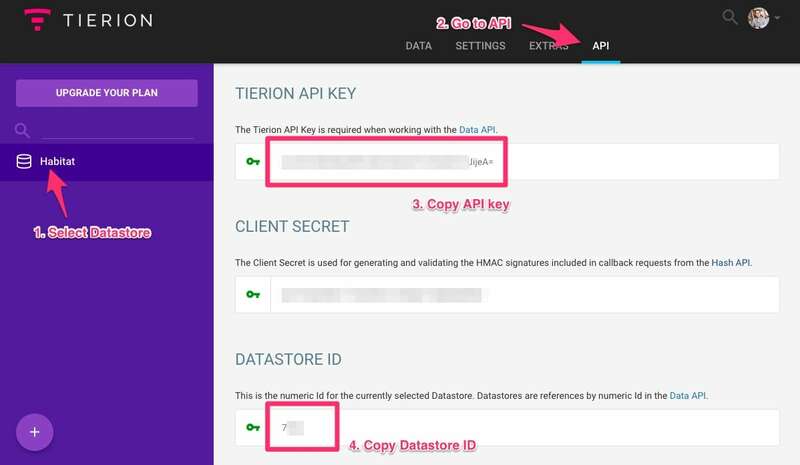 The Tierion API has an endpoint for that at https://api.tierion.com/v1/records. You provide that endpoint with a datastoreId parameter, and some authentication data, and it returs the last 100 records. It lists the most recent first, and we can use that to find the current owner of a habitat. In the blockchain app we’re going to interact with 3 endpoints of the Tierion API. Every time we do that we’ll need to provide authentication headers. It also makes sense to save the Datastore ID somewhere, and the URL of the API. So, as the perfectly organized developers we are, what do we do? We make a struct for configuration values, of course! static let url          = "https://api.tierion.com/v1"
static let datastoreID  = "..."
static let username     = "..."
static let key          = "..."
Whoah! Let’s deconstruct that. In short, this function sends a GET request to the Tierion API, with a few parameters. The fourth parameter encoding tells Alamofire we want to encode the parameters collection using URL Encoding. Other options include JSON, for instance. The fifth and last parameter headers contains a dictionary with HTTP request headers. It’s using a variable headers that we’ll code later. The request(...) function is neatly chained to another function called responseJSON(completionHandler:). We provide it with a closure, also called a completion handler. This closure is executed when the HTTP request completes, so when a response has come back from the Tierion API. The closure has one parameter response of generic type DataResponse<Any>. Without going into it too deeply – we’re leaving out the argument label for the completionHandler closure, because it’s the last argument. This is called a trailing closure. The [unowned self] is called a capture list, and we’re indicating that this closure shouldn’t strongly retain self. If your app has become a hot stinking mess of nested callbacks, also known as “callback hell”, then I recommend you check out how Promises work. This makes the headers constant available for any function that’s part of the API class, so we can reuse those headers in different parts of the class. If you look closely, you’ll see that the headers constant contains the constants we defined earlier. They’re now used as HTTP request headers. The above screenshot is of the Mac app Paw. It’s simply the best app to inspect, test and document webservices and REST APIs. The JSON has one root element, an object, with an array records that contains objects that have an id, label and timestamp. You can read more about Tierion’s blockchain API in their documentation. Remember how we’re using the blockchain to match habitats with their owners? When processing the JSON, all we really need to do is decompose the above data format and turn that into an array of Purchase objects. Let’s do it step by step. In the next few paragraphs I’ll show you how to code this part of the app. The complete implementation of the getAllRecords() comes after that. Easy, right? You can add it right after let headers ... and right before the func getAllRecords() .... The property is initialized as an empty array of Purchase objects. Note: In a properly architected blockchain app you wouldn’t use the API class to store structured data. Instead, you’d use Realm or Core Data, and save objects in the database. For the purposes of this tutorial however, we’ll use the above purchases array as our local datastore. Here’s that HTTP request again. Inside the closure we have access to self and response, of type DataResponse<Any>. You access the records data by its key "records" and cast it from Any to [[String: Any]] or “array of dictionaries with string keys and any values”. You also use conditional binding to safely cast. The conditional body won’t execute when the cast fails, because it then returns nil. How do you know what the types of the JSON data are? Most JSON data consists of arrays, dictionaries, numbers and strings. Most JSON dictionaries, called objects, have String keys. When you check out the JSON data with the previous screenshot, you see that the top-level element is a dictionary, and that the "record" element is an array of dictionaries. A trivia question for you: how do we know that the type of json["records"] is Any before casting it? Then, the next thing we do is empty the purchases array, to start with a clean slate. Why do we write purchases.removeAll() inside the if let conditional statement, instead of outside it, or even outside the Alamofire.request(...) code? That’s because inside the conditional we’re fairly certain that the JSON data has been received in good order. And we don’t run the risk of removing the data we have, only to discover that the new data is incomplete or malformed. Then, we loop over every item in the records array. After all, you want to process every record in the JSON! Do you know the type of item? What kind of magic is that!? This time we’re casting to Double so we can use that value to initialize a Date object with the timestamp. As a result, the Swift Date object now points to the correct date and time. Then, the label… That’s a bit more complicated! Remember how we’re using the "label" on an item as a shorthand to store the habitat name and owner? Tierion’s API doesn’t return the complete blockchain object for the /records API endpoint. We need that information, so that’s why we’re kinda misusing the label for another purpose. You’ll see later on in this tutorial how we’re adding the data to that label. If we want to decompose the habitat and owner from that, the only thing we need to do is split the string on the ; character, and get the first and second elements. The a array now has this value: ["Schiaparelli", "Mark Watney"]. We’re simply adding the purchase object, that we’ve just filled with values, to the purchases property on the API instance. Ultimately, this will fill up that array with purchases found in the JSON data. Any habitat can be bought by multiple owners, but only one is the current owner! How do we know who the current owner is? Think about it. I’ll wait. Got it? It’s the last owner in the purchases array, if you sort it by most recent purchases first. In the above code we’re using the sort(_:) function. Without going into it too deeply – the sort(_:) function takes a closure. Within the closure you compare any two values and return whichever is greater. In the code above we’re sorting the most recent date first, so the most recent purchases end up first in the array. Finally, we want to notify the table view controller that its data has been updated. 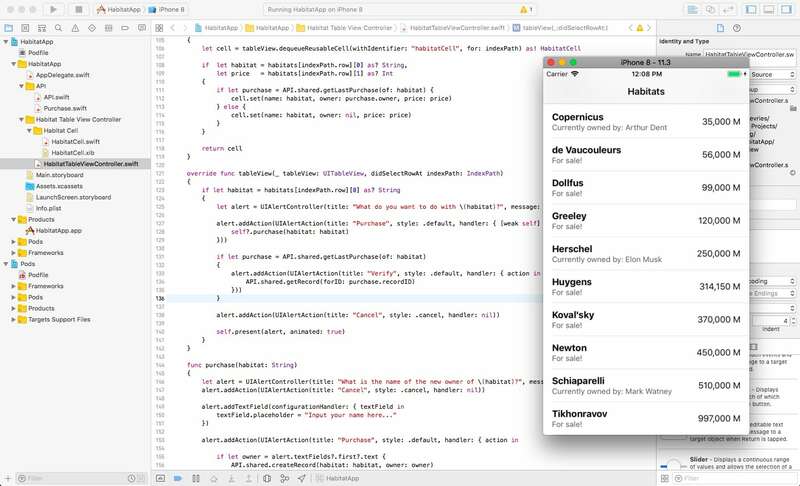 We can do so by using Notification Center, a super useful Swift class that you can use to broadcast information between components of your app that aren’t directly related to each other. You can also add the following extension to the API.swift file, or its own file, so we can use that notification name as .recordsUpdated. With the post(...) function you’re posting a notification to the Notification Center. Any observer that’s listening in for that type of notification will get subsequently notified by the Notification Center. It’s ideal for broadcasting one-to-one and one-to-many signals between components of your app. That wasn’t so bad, was it? Let’s continue! Now that we’ve written the code to get the records from the Tierion API, we can put that code to use. All this happens in the table view controller class HabitatTableViewController, so make sure you open that file in Xcode. This code registers the current instance of the table view controller as an observer for the .recordsUpdated notification. Note the syntax of addObserver(_:selector:name:object:). See how we’re telling Notification Center to call onRecordsUpdated(_:) on self when the notification .recordsUpdated is posted? This initiates the API request we coded earlier. So first we’re registering the observer, and then we’re calling the function that ultimately posts the notification. Easy! See how that works? Remember this line of code you wrote in the function set(name:owner:price:) of HabitatCell? When owner is nil, the label text is “For sale!”. When it is not nil, the label text is “Currently owned by: […]”. We’re using that bit of code to show the user who the owner of a habitat is. Previously, we structured the JSON data from the /records endpoint to create Purchase objects. We also figured out that when the purchases array is sorted most recent first, we can pick off the first item of a filtered array to find the owner of any habitat. func getLastPurchase(of habitat:String) -> Purchase? We’re using the first(where:) function on the purchases array. Every Swift array has this function. What the function does is simple: it returns the first element of the array for which the where closure returns true. The $0 shorthand is the first (and only) parameter of the closure, the current element of the array that we’re inspecting. Its type is Purchase. We’re assessing whether that element’s habitat property is equal to the habitat function parameter. The first(where:) function will actually iterate over the purchases array, and call the closure for every array item. Whenever the result of that closure is true, the iteration stops and that Purchase object is returned. The return type of first(where:) is the same as the type of the array objects, so that’s Purchase. It’s also an optional, because first(where:) can potentially return nil when it can’t find an item that satisfies the predicate. Therefore, the return type of our function is Purchase?. And as usual, we’re using trailing closure syntax to make this function super concise! That closure mechanism is called a predicate, which is like a “rule” that needs to be satisfied, or a condition that needs to be met. For every purchase in purchases, assess whether the habitat property is equal to the habitat function parameter. If it is, return the purchase object. If the entire array is iterated without finding a match, the function eventually returns nil. What’s even more interesting is that both function implementations use the exact same mechanism for finding a first array item that satisfies a given condition. Note: The getLastPurchase(of:) function obviously only works when the purchases array is sorted properly, i.e. most recent first. You’ll often find that these software engineering problems can be solved by structuring, organizing and filtering data. In fact, that’s what a developer’s job is about 99% of the time! Now that we can figure out the owner of any habitat, let’s put that function getLastPurchase(of:) to use! 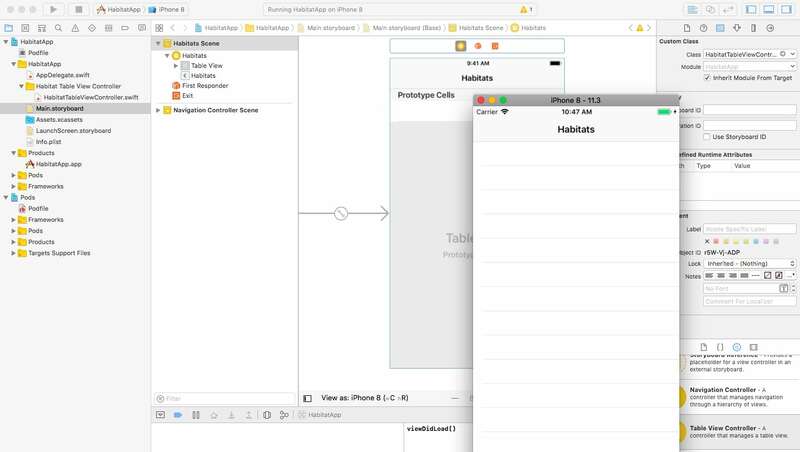 Switch to HabitatTableViewController.swift and locate the tableView(_:cellForRowAt:) function. Locate the set(name:owner:price:) function call in the function body. The tableView(_:cellForRowAt:) function provides table view cells to the table view controller. It’s also the function responsible for giving the cell the right data. So that’s the function that wants to know who the owner of a habitat is, so it can tell the table view cell. How do we want to change this function? Awesome! When you run your app now with Command-R or the Play button, it should compile without errors. You won’t see any owned habitats in the app yet, because we haven’t created any blockchain records yet. Let’s change that in the next chapter! Important: In a production-ready blockchain app you wouldn’t interact with a public API, such as Tierion’s, directly. Even though the API requests are encrypted with SSL/HTTPS, you can easily extract your API keys and secrets from an app binary. When someone has those, they can create “fake” requests to your Tierion datastore, and basically do whatever they want with it. For the sake of education, we’re directly interfacing with the Tierion API in this iOS tutorial. In your own blockchain app, you’ll want to put a webservice between the app and the Tierion API, so you can use OAuth2 authentication, logging, access control, to create a safer and permissioned blockchain app. The most important feature of your blockchain app is missing: purchasing habitats! 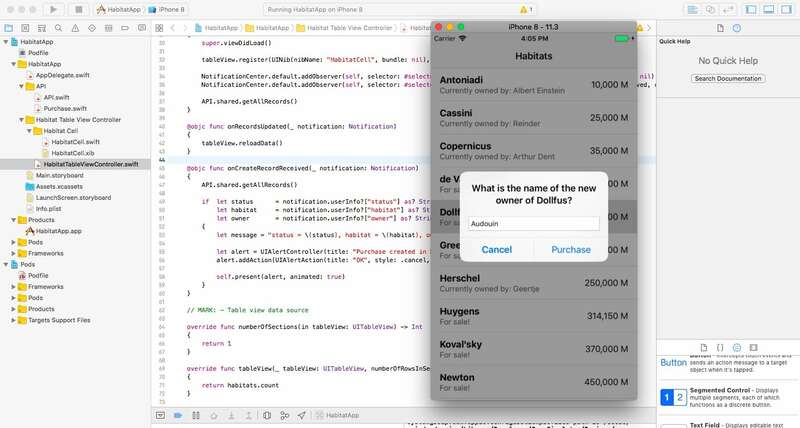 So far, we’ve connected to the blockchain to get data about purchases, and show that data in the app, but we haven’t yet added the functionality needed to make habitat purchases. When a user of your blockchain app wants to purchase a habitat, what they’re really doing is storing a record in the blockchain. That record is the proof that they purchased the habitat. So, if we want to enable the user to purchase a habitat, we need a way to store records in the blockchain. And what better place to do so than in our API class? Provide the request with datastoreId, habitat, owner and firstname (label) parameters, encoded as JSON. Don’t forget to send the headers! If you can do that on your own, go for it! If not, bear with me and I’ll walk you through it. It’s a simple dictionary that contains values for the Datastore ID, and three fields: habitat, owner and firstname. Note that we’re using the habitat and owner function parameters, and the datastoreID constant. That firstname parameter is what ends up in the label field of the response in getAllRecords(). Remember how we used split(separator:) to decompose the label field? Unfortunately, the Tierion API doesn’t return all the custom fields of our datastore records for the Get All Records request. Instead, it provides a generic “label” for every record. We can change the value of that “label” by (mis)using the firstname field of the Create Record request. Just as before, we’re using Alamofire to set up the request, and attach a response handler with responseJSON(...) with a closure. The request(...) function takes the request URL, the request method .post, that parameters array, a encoding setting for JSON, and the headers property. Within the closure we have access to the parameter response that contains the request response data. This is similar to what we did in the previous request handler. The response JSON data is of type [String: Any], and we’re trying to get to the json["status"] value, and cast it to String. See how status is a top-level element of the JSON response? And we’re providing those parameters in the request body, too. The difference between unpublished and published is exactly what the Proof of Work, that we talked about earlier, is about! Whenever a purchase is initiated, and the request successfully completes, that .createRecordReceived notification is posted to the Notification Center. If we observe those notifications, we can respond to them, for instance by confirming the purchase and displaying the blockchain record status. See how we’re adding an observer for .createRecordReceived? When that notification is broadcasted, the function onCreateRecordReceived(_:) on self is called. And self is the current instance of the table view controller, of course. That’s important! Whenever a purchase is made, we want to update the table view with new habitat-owner data. It makes no sense to just reload the table view – no, we need to get the data from the Tierion API. Remember when we created that userInfo dictionary in createRecord(...), to send together with the .createRecordReceived notification? This is that exact same data. In short, we’re using conditional binding to get the values from userInfo, while using conditional casting at the same time. When all three casts succeed, the conditional executes, and we can use the values from status, habitat and owner. let message = "status = \(status), habitat = \(habitat), owner = \(owner)"
That’s simple code. It creates a message that includes the purchase data, and then shows that to the user by using an alert controller. You can learn more about alert controllers here. If you’re getting the feeling that we are building this blockchain app backwards, then you’d be right. You first write a function, and only then you can use it! Even though our blockchain app is primarly used to purchase habitats, we’ve written a whole lot of code to support the purchasing of habitats. In fact, we’ve just written the code that responds to the purchase of habitats. It’s only just now that we’re ready to actually make those purchases. This function purchase(habitat:) has one parameter of type String, the name of the habitat. Then, you’re going to create that alert dialog. We’re using the dialog to ask for the name of the new habitat owner. Text fields are added to a simple array that’s part of the alert controller, and you can use the closure, as seen above, to configure the text field. Easy, right? When the button is tapped, the closure is executed. In the closure we’re getting the text from the text field by using the alert.textFields array. We then use that owner string to call createRecord(habitat:owner:) on the API. This effectively creates a new record in the Tierion blockchain! Now that we’ve coded that purchase(habitat:) function, let’s put it to use. We’ll do so by calling it when the user taps a table view cell. This is another overriden delegate function that’s part of the table view controller mechanism. The function is executed whenever the user taps a cell. We’ll use it to give the user the option to purchase a habitat. Later on we’ll also hook into this function to let users verify habitat owners. This code is similar to what you’ve used in tableView(_:cellForRowAt:). You’re using the indexPath to get the right habitat name from habitats. The closure is executed when the button is tapped. See how we’re using that purchase(habitat:) function we wrote earlier? This is where we finally get to use it! Kind of an anti-climax, isn’t it? You’ll often find that you code abstractions in your app, layer by layer, until the only thing you need to do is call a simple function. It’s magical! Awesome! But… does it work? At this point you can run the app with Command-R or the Play button, and successfully purchase habitats. You can now purchase a habitat by tapping the cell in the table view, and entering your name in the text field. The table view updates, and the record is queued to get stored in the blockchain. When you go to your Tierion Dashboard, you can also see records that have been created in the blockchain, and see their attributes. You should be able to check that a blockchain record hasn’t been confirmed yet, too. It can sometimes happen that purchases don’t immediately show up, even though you’ve just made them. That’s most likely because the responses from the Tierion API are cached for a short while, or simply not committed yet when you refresh your data. One way to solve that is by implementing a simple pull-to-refresh interaction. Here’s how. Finally, make sure to add the following line of code to onRecordsUpdated(_:). Otherwise the refresh control keeps spinning, even though the data has been successfully refreshed! In short, the function getAllRecords() on the API is called whenever the user pulls on the refresh control, effectively refreshing the table view data. The refresh control resets when the data has been received. Let’s continue with the next and last step of building the blockchain app. Now that we’ve completed the biggest aspect of your blockchain app – storing records in the blockchain – we are going to build the feature that makes the blockchain unique: verifying data. Earlier we discussed proof of work, and how blockchain miners get rewarded for constructing blocks of pending “facts”. The Tieron blockchain platform takes care of all this for us. 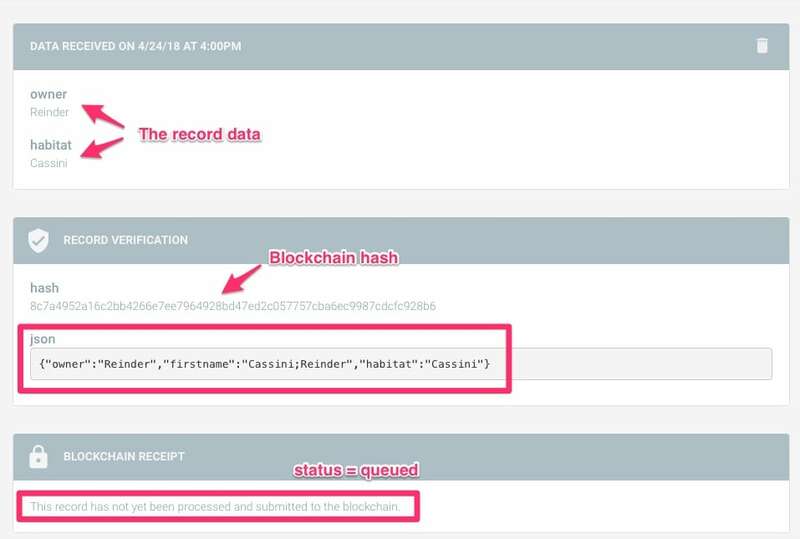 When you add a new record to your datastore, it automatically gets queued for storing in the blockchain. Subsequently, miners pick up the work and incorporate your data in the blockchain. The chain of blocks, and its confirmations, guarantee that your data is irrevocably stored in the blockchain. Blockchain-as-a-Service platforms don’t store the exact data in the blockchain, but instead store a cryptographic hash value of that data. This has the added benefit of privacy, because a blockchain is public. And because hashes transform data of arbitrary size to fixed values, they’re also smaller than the orginal data. It can take a few minutes, up to a few hours, to confirm new data that has been added to the blockchain. Because of the way blockchain mining works, it’s uncertain when a new block is mined, and therefore it’s uncertain when a pending fact is successfully added to a newly mined block. That’s where the status property of a datastore record, as stored in the Tierion blockchain, comes in. As discussed, it has three options: queued, unpublished and complete. A record has successfully been added to the blockchain, and has been confirmed by it, when the status is complete. Said differently, the purchase of a habitat isn’t confirmed until it’s status is complete. Naturally, we want to code something that allows the users of your blockchain app to verify purchases! The getRecord(forID:) function is very similar to the getAllRecords() function, except that it gets one specific record instead of all records. Just as before, we’ll prepare an HTTP GET request with Alamofire, process the data once it comes in, and send a notification to the Notification Center. Easy-peasy! The function getRecord(...) only has one parameter recordID, with an argument label forID. That’s convenient, because now we can use it as: getRecord(forID: "abcd"). See how there’s one root object, with values for status, data and timestamp, and how that data object has values for habitat and owner? The above conditional binding uses the JSON dictionaries, and optional casting, to get to the right data. If you look closely, you’ll see that it first gets the root-level elements status, timestamp and data. Then, it goes deeper into data to get habitat and owner. We’re using typical types like String, Any and Double to cast the values to the correct types. Then, inside the conditional we only have to format the data and post it as a userInfo dictionary alongside a notification. This code block sets up a DateFormatter object with a “short” date style, which is usually dd-mm-YY depending on your locale. A Date object is constructed with the Unix timestamp we got from the JSON response data. It then uses that formatter and the Date object to get a date string. Are we going to listen for those notification broadcasts? Of course we are! Just as before, we’re going to add an observer for .getRecordReceived and write the function that fires when the notification comes in. See how the function onGetRecordReceived(_:) is called on self when the .getRecordReceived notification is observed? In this function, you’re going to decompose the userInfo collection you constructed earlier, and show its values in a simple alert dialog. Again, we’re doing our little conditional binding and optional casting dance to get to the correct values. Don’t let it fool you, though! Remember that the type of userInfo is [AnyHashable: Any]? in this function, so you really need to cast the data to be able to treat it as strings. let title = status == "complete" ? "Ownership verified!" : "Ownership not verified"
let message = "habitat = \(habitat), owner = \(owner), date = \(date), status = \(status)"
The title shows whether the ownership of this habitat is verified, or that we’re still waiting for confirmation. And the message shows a simple list of values. The UIAlertController has no actions, except for a Cancel button, so it’s just really “FYI”. Can we now finally verify if Bob is the true owner of Bob’s Red Fantasy Land in the Schiaparelli crater on Mars? YES! First, locate the tableView(_:didSelectRowAt:) function in the HabitatTableViewController class. Inside it, you’ve coded an instance of UIAlertViewController that has two actions: Purchase and Cancel. You’re going to add a third action, Verify. You can add it between the let alert = ... line, and the alert.addAction(... for Purchase. Why don’t you try out your app to see if it works? 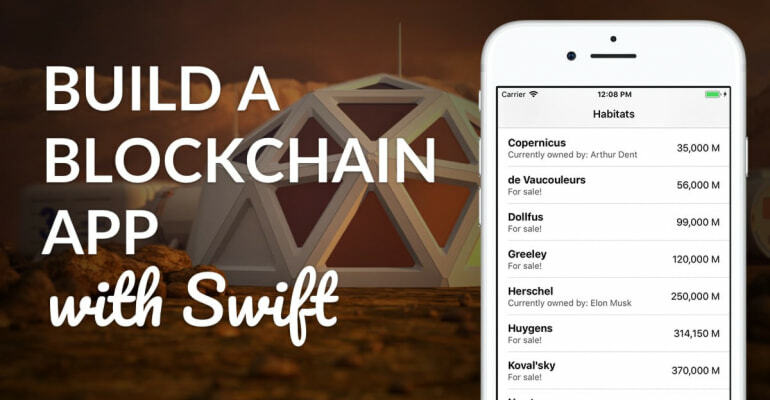 And that, ladies and gentlemen, is how you code a blockchain app with Swift! Thank you for making it this far, and if you have questions, I’ll see you in the comments below. If you ask questions that you could have Googled faster than you could write them in the comment box, you owe me an apple pie! The Blockchain Explained series – a must-read!